There's a very good reason why Alice Munro is consistently referred to as one of the best short story writers in the world. Quite simply, because she is. I first discovered Alice Munro when I was in my twenties. Despite being a Winnipeger, I found immediate resonance in her tales of life in small town Ontario, lives primarily of girls and women. The fact that she wrote about female coming of age with a searingly unsentimental yet deeply profound voice, felt at times as though she was writing my life. I quickly devoured everything she had ever written, and then moved on. 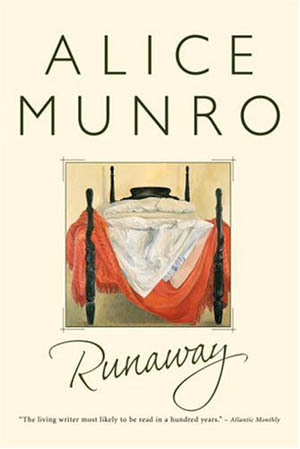 I recently stumbled upon Runaway - Munro's 2004 collection of short stories - at the library, realized it had been years since I had read any Alice Munro, and took it home. Some of the stories in Runaway follow the same characters over time, geography, and circumstance. I love the continuity in that approach, mainly because my main objection with Alice Munro's short stories is that, although they are as fully realized and as deep as any novel, I miss the characters when the story is done. It's comforting to see them return to the pages, older, and though not necessarily wiser, certainly with a different understanding of life. The final story in Runaway, although a single story, is divided into chapters and spans 50 years. Perhaps another reason that Alice Munro's writing keeps resonating with me is that just as I read her coming of age stories as a young woman, I now find something of myself echoed in her current stories about women of a certain age. Munro is at her very finest when she writes of the small tragedies of life, those often unexamined minor twists of fate that subtly but irrevocably tinge the future. Those missed encounters, those lies we tell ourselves, those misunderstandings that are never resolved - these are the currency of Munro's stories. The collection of stories in Runaway enthralled me, moved me, and left me slightly wistful but much richer for having read them. You really should read them too. How I enjoy good short stories! Oh how I've wanted to enjoy Munro. Alas, I only find her boring. And I'm a little too hung up on semantics, because I wish there was another term for short stories that aren't really short at all, as Munro writes. Have you read any of Alice Munro's stories, Vicomtesse? Very satisfying. I recall your dissatisfaction with Munro's stories, John and I think you should be deported. I kid, of course, but I find it curious that we can have such opposing reactions to her work. I do have to agree on the short, not short, issue. she use to spend her winters here and I met her a couple times. I was always surprised that she was a writer of her stature and after meeting her I was not interested in reading her works. Sorry to say she seemed well, not too bright and not interested in what anybody else had to say. That's disappointing to hear, Kelly. Perhaps she was always writing something in her head; I know I project "not too bright and not interested in what anybody has to say" when I am writing stuff in my head. Looking for a new author to get into -- thank you for the lead! Happy to help, Vol-E! I'm always looking for new authors myself. I have an odd relationship with Alice Munro's books. I really want to like her but something holds me back. I do respect her writing and think she is incredibly insightful. I just keep working at it and continue to read her,hoping for a connection. How odd, I seem to be the only real Munro fan in the bunch, Kathy. I have to give you props for not giving up on her. I tend to set aside authors that don't connect with me.